I will have to use a lot of superlatives to describe this car! The original floor mats are still there without any wear. The carpet is like new as well of course. This Biarritz was ordered with most of the available options except the sun/astroroof. Everything else you could order in 1978 for the Eldorado is there and works as it should. I recently replaced and repaired the complete brakes front and rear with all new parts, as they had suffered from storage. The parking brake which is a little complicated did no longer work as well. I went through all the mechanical stuff, repaired the AC, the radio, installed a correct, original and very hard to find CB antenna, fixed some other smaller stuff, and would now drive the car anywhere. The previous owner installed brand new Vogue tires, which look great on this car in my opinion. The easiest and most fitting way to describe this time capsule would be to imagine its 1978, and you have a chance to buy a very well cared for dealer demonstration car, which is only a couple of months old. 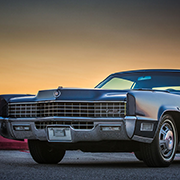 The Eldorado comes with the smooth 425 engine which purrs like a kitten and a perfectly shifting transmission.